I was admiring the Hong Kong food-inspired Valentine's Day illustrations from Mochachocolata-Rita when it occurred to me to make a Vietnamese one. Well, except my drawing skills are limited to stick figures, and pretty sad stick figures at that. 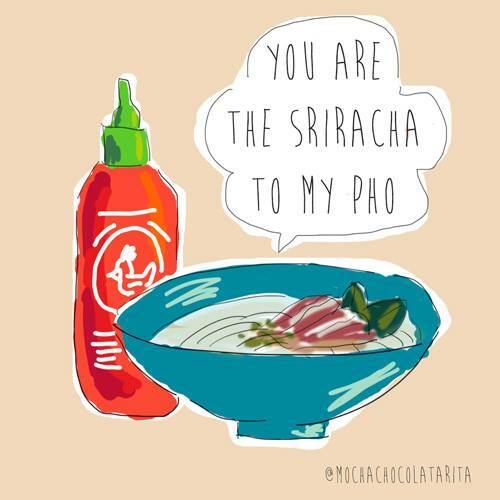 So I asked Rita if she could draw an illustration for me that said, "You Are the Sriracha to My Pho." She came back in less than an hour with the above. I looove it! 4 years ago today, Hong Kong East Ocean Seafood Restaurant (Wedding Banquet) - Emeryville. 5 years ago today, driving I-5 from LA to Portland with lil' sis. 6 years ago today, nectarine blossoms and musings on the grilled cheese sandwich. 7 years ago today, chocolate buffet at the Sofitel Plaza - Saigon - Vietnam. Awww thanks so much for blogging this, dahling! yes, i would buy a tshirt (or few) to wear. loooove this. Aww, it's not "Pinnable!" Love the design though. I'd buy the shirt too!